The folks at Shebeen Brewing Company in Wolcott, CT were looking for a label for their new Hoppy Saison style beer. The name was inspired specifically by the Equanot hops used in the brewing process, which reminded the brewer of the cosmos. Given freedom to explore the concept creatively, the following is the how Space Farmer came to fruition. Grant Wood's American Gothic is the one of the most famous representations of rural America ever created. Here, I used that established equity to propel the "Farmer" aspect of Space Farmer. 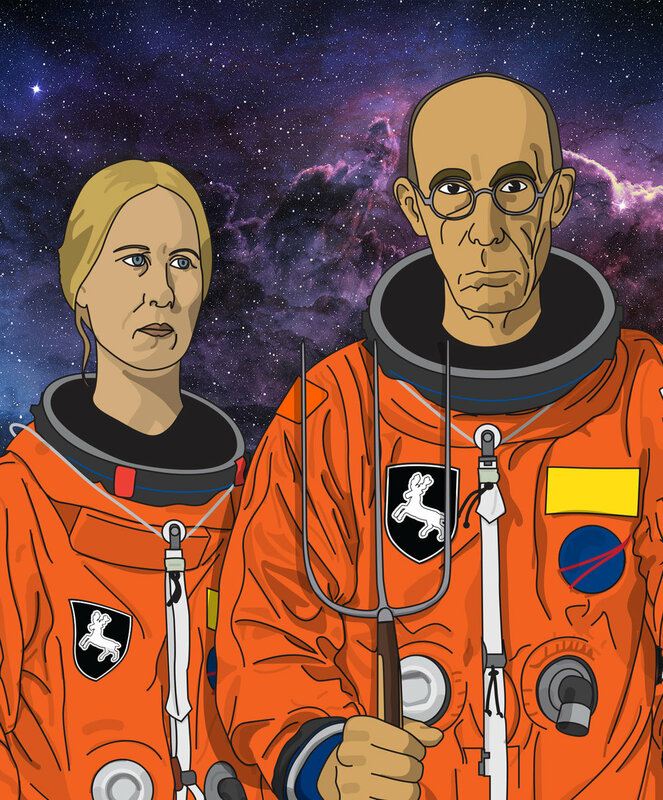 As for the "Space," I illustrated the couple in the NASA standard Advanced Crew Escape Suits (ACES), which are used by astronauts during space shuttle launches. Inspired by NASA mission patches and the works of Aaron Draplin and James White, I created my own chunky-lined iconographic "patch" logo. It features a hop with rockets attached, blasting into space. Adhering to the TTB standards for beer-labeling, The final 16oz can features the above elements combined with client-supplied copy, brewery logo, and deposit information, placed on a purple-hued space backdrop that really helps the orange in the logo and illustration "pop" off the shelf.